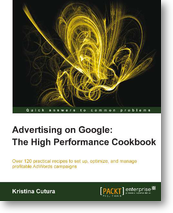 I am excited to announce that after a long year of work, my book Advertising on Google: The High Performance Cookbook was published today. The book is a step-by-step guide with practical tips and lots of examples and screenshots to help you run effective Adwords campaigns. I’d like to thank my publisher, Packt Publishing, for proposing this project to me and for moving it forward. If you have any feedback or comments, please feel free to email me. This entry was posted in Google AdWords, PPC and tagged adwords book, adwords books, adwords ebook, adwords make money, adwords training, adwords tutorials, google advertising book, optimizing adwords, pay per click book, pay per click ebook, pcc ebook, ppc book on June 26, 2013 by kristina.